December 2012 - An Opportunity to Celebrate Life! I love the holidays! This year has already been especially rich. We just returned from Maui. You are probably thinking Maui is the most wonderful part of the holiday – but no! Sure sunshine, warm water and the beach are great! But the most wonderful part of our Maui trip was being there with our friends, Jim and Renee. Earlier this year, Jim faced a life threatening illness, kidney failure. More than on one occasion we thought we were going to lose him. So when they kept talking about Maui for the holidays, I must admit I wasn’t counting on that happening. Still, they maintained their commitment and at the last minute we just could not let the opportunity pass and jumped on a plane to meet them. Jim was inspiring. He couldn’t swim and had to go every other day for dialysis, but his light was bright and an awesome reminder of why I love this time of year! The simple joys of being with friends! Yes, I love Christmas. Though it isn’t really about the religious story of Christ for me. Maybe it was a winter’s night when he was born. Granted, I think the story of baby Jesus makes a great reason to come together and remember that our differences can so easily be overcome with heart, connection and good will. Isn’t that really the essence of the baby Jesus story? Mary needed a place, there wasn’t any rooms at the inn and some people found a spot and made it cozy. I have no doubt that some warm-hearted strangers helped Mary and Joseph out that night. Child birth isn’t all that easy. So I picture folks helping and gathering. Now, whether you believe in the rest of the story or not, that part of the story for me is is the heart of the holidays. I believe I have always loved Christmas. I love singing carols, and when I was young remember well our friend Ruth ‘Charlie’ Brown gathering everyone to go to nursing homes and through neighborhoods singing. It was fun and she not only did that in December, but throughout the year would call and suggest a night of caroling, just to keep the spirit of the holidays alive. One July we were out in winter wear, singing our hearts out. People loved it! They laughed, they sang and once again whatever differences folks might have had were bridged. There were some harder and lonely holiday times. However, no matter how dark things seemed in my life, the holidays always bought lightness and joy. For a few years I worked on Christmas. I didn’t have family around, and I would sign up for the Christmas shift. I worked in the hospital pharmacy. We would gift wrap the IV bags and go room to room singing carols of all sorts. The people who had to be in the hospital seemed to love our hospital cart and we of course had a blast! When I was struggling with my own health, I gift wrapped my own Chemo bags and played carols which I found way more uplifting than simply getting the standard chemo IV. There were a couple years there when I doubted I was going to be around much longer and was very lonely. One year on Christmas Eve, I walked down the street to a local church. They invited me in like I been part of the family forever. The music was awesome and when I got home, I just wasn’t so lonely. That was the same year I would head out to the airport and simply watch people greet family and friends. Back then there were not security areas and anyone could be at the gate as people stepped off the plane. I was inspired and would sit with tears in my eyes. I doubt anyone ever noticed how much their joy touched my life and gave me the heart to keep going. So yes, I love the holidays. May be it is because this is the time of the darkest and longest nights. It can seem lonely and hard. 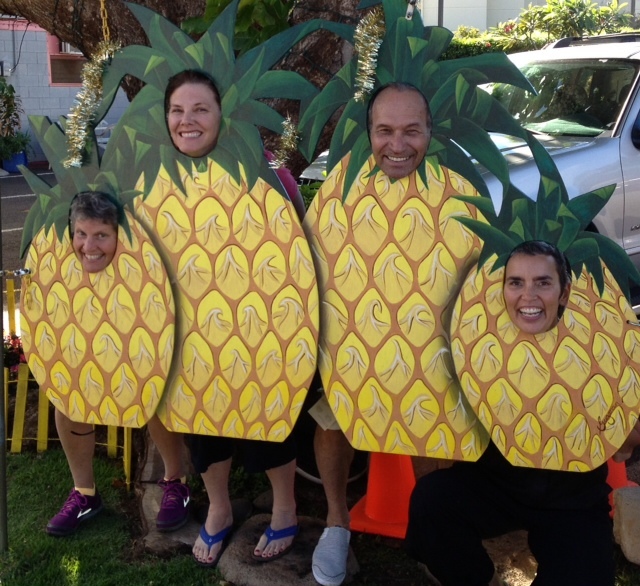 Yet the simplest things, pictures with pineapples, candles, songs, jumping on a flight to Maui, having turkey sandwiches with friends – connect us. Sure, people still fight about saying Merry Christmas vs. Happy Holidays. We shop and get way too caught up in the commercial side of things. However, every year there are stories just like the baby Jesus story or Jim’s bright light – of people reaching beyond their differences or rising above life’s challenges. People get together, sing, laugh share and fill the darkest night with the brightest light! That is why this is indeed the most wonderful time of the year!! The Island of MisFit Toys & Finding Your Own Special Light! Of course, almost everyone has heard of Rudolph The Red Nosed Reindeer. Rudolph became famous one snowy Christmas Eve night, when he fully discovered his own unique light! 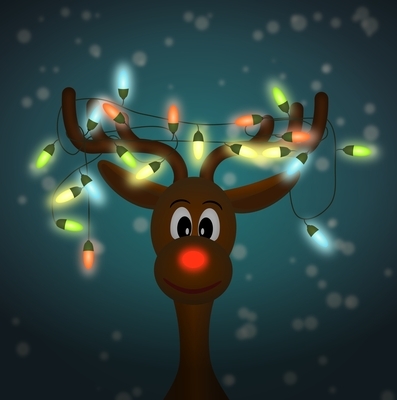 Was a night when normal was simply not good enough, and Rudolph’s nose shone ever so bright! T’was Santa that called him from that land of misfit toys and made him a hero for all girls and boys. Many assume that the North Pole, Santa and flying reindeer are simply a fantasy designed to entertain children. However, I do believe in the Land of MisFit Toys – of that I know for sure. There is at least one regional hub that sits in the north. The Haven they call it, down here, of course. I know this place exist because I happen to be one of those misfit toys that found my way there. Growing up I was always a bit of a misfit. I was too loud, too intense, or always too something. I struggled in school, wasn’t able to spell or read or be cool! Use to get teased and called funny names. Indeed, found it hard to play all the games. Yes, I could relate to Rudolph. I managed. I found ways to fit it and just figured some day I would either find a way to be normal or just be ok being me. I found some interesting ways to explain my differences, and looking back think I was quite creative. Still, there was always this loneliness and sense of not fitting in. Then one rainy northwest day, I found myself at The Haven. T’was Ben that came to say, “Susan with your odd and interesting way – won’t you come to The Haven and play?” Well, I never really “saved Christmas” or anything that awesome. But I did take my odd and interesting way up north to the island where misfit toys find their way. There I discovered that misfit was simply another word for unique and different. I also learned that it might just be easier to stop trying so hard to fit in or convince others I was okay. That a little acceptance and compassion on my part would go a very, very long way. You see it’s not about changing me or the world. No, it’s really about seeing what’s already there.There’s really is no normal or best way to be. There simply is you and there simply is me. If we could just get that different is cool. It really doesn’t mean we get kicked out of school. I think if that was the message we shared, there be no real reason to bicker and scream. No, then we could simply enjoy being on the team. So this holiday time I strongly suggest: Don’t fight to be normal or simply exist. Remember the true spirit of Rudolph and the land he came from – it’s not about presents and being just right. It’s more about finding your own special light and shining it bright! !